Are you in the market for a new pickup truck? Luckily, the 2019 Chevy lineup is here and better than ever. Not only will this reputable brand meet your expectations when it comes to reliability, power, and performance, but it will even surprise you with its available safety and entertainment technology. And here we’ll take an in-depth look into one of Chevy’s best options in the 2019 pickup truck lineup: The 2019 Chevy Colorado. The Chevy Colorado is an iconic truck that’s known for its power and durability. With that iconic Chevy emblem, powerful chassis, and the capability to handle any job, the Chevy Colorado is an All-American vehicle that’s a legend on the road. The 2019 Chevy Colorado has upped its game with new performance capabilities as well as the latest high tech connectivity and safety features. Be sure to check out the 2019 Chevy Colorado the next time you visit a dealer, we promise you won’t leave disappointed. The 2019 Chevy Colorado boosts its reputation with an all-new exterior design, powerful towing and horsepower capability, and the interior extras that will make those long car rides a breeze. And don’t just take our word for it! The 2019 Chevy Colorado has a number of accolades to its name, including ‘America’s Most Fuel Efficient Mid-Sized Pickup Truck with 30 mpg, “Best-in-Class Maximum 308 horsepower with available 3.6L V6 engine”, and “Best-in-Class Maximum Available Towing (7700 lbs) with 2.8 Turbo Diesel Engine”. The 2019 Chevy Colorado is getting a lot of notice around town, don’t you want to take it out for a test drive today? If there’s one thing that the 2019 Chevy Colorado doesn’t lack, its performance. This mid-sized truck is available with three engine options: a powerful 3.6L DOHC V6 engine with best-in-class horsepower, a 2.5L 4-cylinder option that delivers 200 hp and 26 mpg on the highway, and a GM Exclusive Duramax 2.8L Turbo Diesel engine with best-in-class torque. Whether you’re looking for your next commercial vehicle or looking for a truck for those weekend warrior outings, this is a truck that has the powerful performance for any activity. The 2019 Chevy Colorado also pushes the limits with the new 2019 Colorado ZR2 bison, the first ever off-roader from the American Expedition Vehicles and Chevrolet. This Chevy model includes an off-road chassis, 5000 lbs of towing capability, 31 inch Goodyear tires, aggressive approach, breakover, and departure angles, and tubular rocking protection. This is a great model for those who are looking to take their trucks on tough landscapes like rocky terrains, desert dunes, or shallow creeks. With superior performance and a maximum towing capacity of 7500 lbs, this is a great vehicle for work or for personal use. Whether you’re taking this vehicle offroad, using it to haul for your commercial business, or just for daily use, this is a vehicle you can rely on to deliver constant power and performance. Truck buyers want the trucks performance to match the exterior, and the 2019 Chevy Colorado doesn’t disappoint. With its powerful capability, this Chevy truck has the exterior to match, with a rugged and aggressive front grille, including the iconic Chevy bowtie emblem, an aerodynamic and sculpted body, and an expansive bed with a spray-on bedliner. For those who like plenty of options when it comes to truck buying, then the 2019 Chevy Colorado has the variety you’ve been looking for. The 2019 Chevy Colorado is available in four different models: the Redline, Midnight Z71, Custom Edition, and the ZR2 Dusk. The Redline is a great truck for buyers who are looking for an extended cabin, as well as additional aesthetic perks like black window trim, 18-inch wheels with red trim, and off-road assist steps. The Midnight Z71 has a sophisticated black exterior, black grille and bowtie emblems for an aggressive aesthetic, and a unique Z71 hard badge. For buyers looking for a unique and distinctive look, the Z71 is a great Chevy Colorado model to consider. And if you’re looking for something that no one else will have on the road, then be sure to check out the Custom edition, where you can customize your work truck’s exterior features and all of the Chevrolet accessories. Finally, the ZR2 Dusk is the 2019 Chevy Colorado’s off-road edition available in all colors for those looking for the best new off-road vehicle. If staying connected is important to you, then the 2019 Chevy Colorado is the way to go. With a touchscreen Chevrolet Infotainment system that includes music, GPS, podcasts, audiobooks and smartphone integration, this is a truck where you never have to worry about lost connection again. The 2019 Chevrolet Colorado includes Bluetooth technology, multiple USB ports, and available wireless charging system. With an abundant number of ways to stay connected, this is a 21st-century vehicle that has all the connectivity of your smartphone. This vehicle also includes a built-in WiFi hotspot so you never have to worry about data or service while your driving again. Whether you’re looking for consistent WiFi or for access to hundreds of apps right on your dashboard, then this is the best new truck for you. When it comes to towing and hauling, safety is of optimal importance. Chevrolet built the 2019 Chevy Colorado with safety in mind, including a high strength steel frame, a reinforced safety cage, dual-stage frontal and seat-mounted airbags, and a number of high tech technologies in order to keep you and your passengers and your cargo in the safest conditions. The 2019 Chevy Colorado includes such high tech safety features as the standard rear vision camera which provides the view behind the vehicle when you’re backing up, an available forward collision alert which alerts you if a front-end collision is imminent so you have time to stop, an available lane departure warning which alerts the driver if they’re drifting out of the lane without signalling, and an available rear park assist which provides distance-to-object alerts to help the driver park. With top-of-the-line safety features, this is a car that is going to keep you safe and vigilant. In addition, the 2019 Chevy Colorado includes an OnStar Safety System which includes everything from automatic crash response which includes built-in sensors that can detect a crash and automatically alert OnStar Advisors, Crisis Assist which can guide you in case of bad weather or emergency, roadside assistance if you need a tire change or run out of gas, stolen vehicle assistance where OnStar Advisors can pinpoint your vehicle’s location and work with authorities to recover your vehicle, and turn-by-turn navigation. You never have to worry about safety again with the new 2019 Chevy Colorado. Not just about exterior style and performance, the 2019 Chevy Colorado also boasts a luxurious interior that’ll leave all Chevy customers happy. The interior of this 2019 truck includes triple-sealed doors to keep out outside noise, ample storage, a heated steering wheel, cloth or leather-appointed front seats depending on your preference, and an excellent Bose sound system for superior audio capability. The 2019 Chevy Colorado also features black and chrome interior accents, plenty of legroom, and an available foldable rear bench seat for extra storage. Seating up to five adults comfortably, and with the available leather seating for another layer of sophistication, the 2019 Chevy Colorado is in a class all of its own. Don’t forget to check out the interior connectivity as well, which features everything from an eight-inch touchscreen display, to built-in WiFi and smartphone integration. When it comes to interior perks, this car has comfort, connectivity, and more. Choose Carl Black Kennesaw for Your Next Vehicle! Being the #1 Dealer in the Southeast Region, Carl Black Kennesaw prides itself on its excellent reputation and customer service. At Carl Black Kennesaw, we have the inventory to suit any of our customer’s needs, including used, new, and Certified Pre-Owned vehicles. Whether you’re looking for your next vehicle, or looking to service your current vehicle, we have the Service and Sales team with the expertise to get you exactly what you’re looking for. 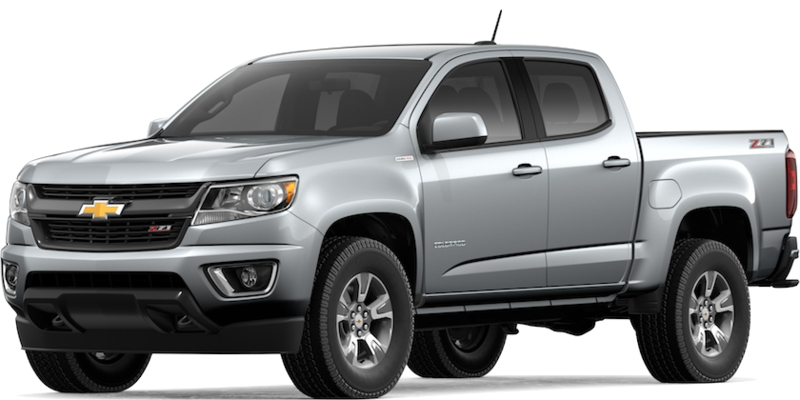 If you’re interested in the latest 2019 Chevy Colorado then you’ve come to the right place. Visit our lot to take it out for a spin today! With the Chevy brand to back it up, as well as its undeniable power and performance, this is a top-of-the-line truck we’d recommend to any truck buyers looking for something with powerful capabilities. With a dynamic exterior, plenty of interior perks, and the powerful performance that’s a constant with Chevy, this is a vehicle where you can’t go wrong. So what are you waiting for? Give us a call or a visit today, we’ll be more than happy to help you!